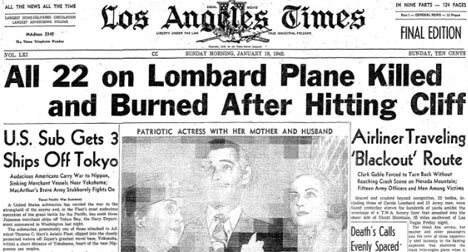 Sunday morning, January 18, 1942, Los Angeles Times, Los Angeles, California, with front page TWA Flight # 3 airliner crash headline and photo of right to left: actress Carole Lombard, actor Clark Gable and Carole's mother. 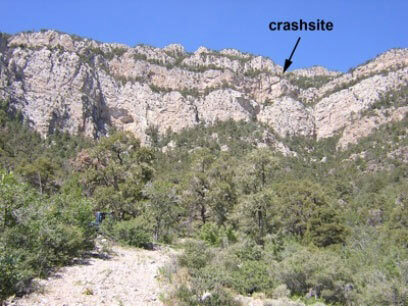 FBI Case File 98-76 dated March 27, 1942, by the Salt Lake FBI office confirmed the airliner took off from the Las Vegas Airport at 7:07 PM Pacific and only 15 minutes later at 7:22 PM had flown with engines revved up straight into Mount Polosi about 500 feet below the mountain’s 8,517 feet crest. August 26, 2016 Springfield, Missouri - A week after the inexplicable, catastrophic crash of TWA Flight 3 flying with engines powered up straight into Mount Patosi, the Chief Investigator for the U. S. Senate Sub-Committee On Safety in Air — at the Los Angeles office — received a detailed eyewitness account by rancher Willard H. George. Next PostNext Zika Virus Threatens Both Adult and Fetal Brain Cells. How Many Mosquito Species Can Spread Zika?